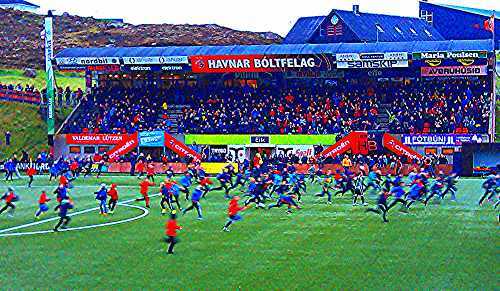 With a 1-0 win over TB Tvøroyri, HB Tórshavn have clinched their 22nd league title. After an even start to the game, HB eventually took over and Christian R. Mouritsen went close a couple of times in identical “trademark” situations, where he cuts into the pitch from the right, and shoots. But TB goalkeeper Ivan Stojkovic dived to keep HB at bay. Heini Vatnsdal should also have done better when he broke into the penalty area on the right hand side, but a poor finish let him down in the end. TB had no real attempts in the first half. HB should have taken the lead early in the second half, but Alex dos Santos fired into the sidenetting from close range when he had the goal at his mercy. HB were living dangerously for a while as TB started to threaten at the other end and Senegalese midfielder Ndende Adama Guéye had a shot from inside the penalty area well saved by Teitur Gestsson. Also Aron Sørensen went close for TB with a header, although Santos moments earlier also forced a master-save out of the TB goalkeeper from a thunderous shot aimed at the top far corner. HB scored the winning goal in the 67th minute after a cross ended at the feet of Ch. Mouritsen who steered the ball into the net. TB had a couple of chances in the closing stages, but they were squandered. With the loss for the TB, it’s only a question of formalities until TB officially are relegated. Mathematically they can still survive, but they’ll have to make up a goal difference of 14 goals… if they beat Víkingur and KÍ Klaksvík will be defeated by 07 Vestur in the last round. ÍF ‘s chances of winning the title were slim, as HB would have to lose both of their remaining chances – today’s match included – but ÍF were still fighting for runners up position, which they secured with today’s win over NSÍ who could have climbed to within a point of ÍF. Instead NSÍ drop down to fourth, which is just outside the Europa League place, but they can still make it in the last round if they beat HB while B36 don’t beat ÍF. ÍF took a 2-0 lead thanks to a brace from striker Øssur Dalbúð; the first coming after 10 minutes and the second with a quarter of an hour remaining. NSÍ then had centre-back Jensen Joensen dismissed, and few minutes later midfielder Høgni Madsen the increased to 3-0 before Klæmint Olsen snatched a late consolation to move two goals clear at the top of the top scorer list with 19 goals. Nigerian forward Adeshina Lawal scored a crucial last minute goal to secure B36 the victory which takes them up to 3rd spot in the table which will qualify them for next season’s Europa League. For EB/Streymur it means that they won’t qualify for Europe for the first time since their second place in 2006. Has an era come to the end or will they regroup? It was also Lawal who had given B36 the lead after 10 minutes, but EB/Streymur Hans Pauli Samuelsen equalized with yet another free kick midway through the first half. AB Argir weren’t mathematical safe from relegation before today’s round, but with an easy 3-0 win over already relegated 07 Vestur, AB’s ticked are formally booked for next season’s top flight. AB went on winning course after a quarter of an hour when 07 Vestur’s Ivorian central defender Tehe Aristide was sent off and AB were awarded a penalty which Jónas Stenberg safely converted. Stenberg scored again shortly before half-time – again from the penalty spot. Rógvi Poulsen then sealed the 3-0 win in added time. KÍ’s only win since 28 April away to AB in the last round proved crucial as the three points and a superior goal difference will keep them safe from relegation, even if they lose their last match against 07 Vestur and TB win. Víkingur scored their three goals inside 10 minutes from the half-hour when Hanus Jacobsen put Víkingur in front. Hans Jørgen Djurhuus doubled the lead in the 36th minutes before Finnur Justinussen headed in to make it 3-0 in the 40th minute.